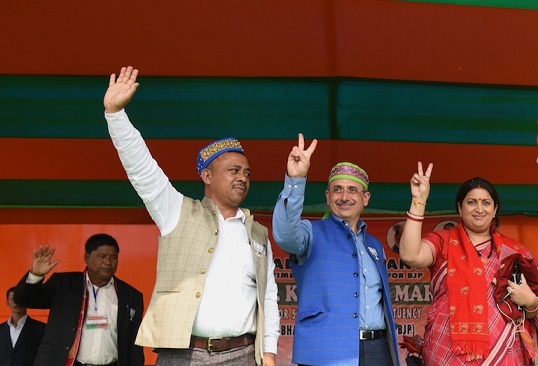 BJP national spokesperson and Meghalaya in charge Nalin Kohli who accompanied Smriti Irani to the Garo hills on Saturday demanded an answer from the Congress over lack of development. “Where are the roads, hospitals and jobs promised by the Congress? All these years Mukul Sangma government has given nothing other than deceit. People will vote for a change on February 27,” a confident Nalin Kohli thundered to rapturous applause from the crowd of several thousand people who thronged the venue of the BJP rally. The lone Garo MLA of the BJP in Assam, Dr Numal G Momin who is camping in Dalu for the campaign also addressed the crowds targeting both the Congress and the NPP. “Congress is husband-wife party and NPP is brother-sister party,” Momin referring to Mukul Sangma and his wife Dikkanchi D Shira and James and Agatha said. The constituency of Dalu is a frontier town having its borders with Bangladesh. Once a flourishing town it was a major export hub through which coal and other minerals used to be transported before the NGT ban took place. Dalu is of intense importance for the BJP after all it gave the party its first MLA from Garo Hills in the 1990s’. The BJP’s N N Simchang was elected from Dalu in the same year two other party candidates, A L Hek and T H Rangad won from Pynthormukrah and Laban, respectively.